AR Uppers for sale at the lowest prices! Over the past several decades, the AR-15 has become an accurate and efficient firearm for gun enthusiasts. It is one of the most popular rifles available today for sportsmen, defenders, and firearms collectors through the United States. The beauty of the AR-15 is that it’s easily customizable. As a result, you’ll have a rifle that fits you and your needs. Whether you decide to build and customize your own AR-15, or just go out and buy one, you’ll have a rifle that feels great no matter what it’s being used for. With DIY, the first step is choosing the AR upper receiver in the caliber and with the features you want. You can buy a complete upper receiver assembly or mix and match barrels and other parts. Once joined with the AR lower receiver (sold only through firearms dealers), add a stock and sights and voila! When you buy an AR-15, you’re getting a great firearm. This rifle has been used by the United States military and has seen many improvements throughout its lifetime. Peace of Mind - The vast majority of dealers offers a warranty with the purchase of an AR-15, so you can return it if there is a problem. Building or customizing one may result in voiding the warranty, or at the very least make it a challenge to get the firearm replaced. Accuracy - The AR-15 is a very accurate firearm. Even its most basic models don’t require much, if any, sighting. While they may not win you any awards in a shooting competition out of the box, they’ll definitely get the job done. 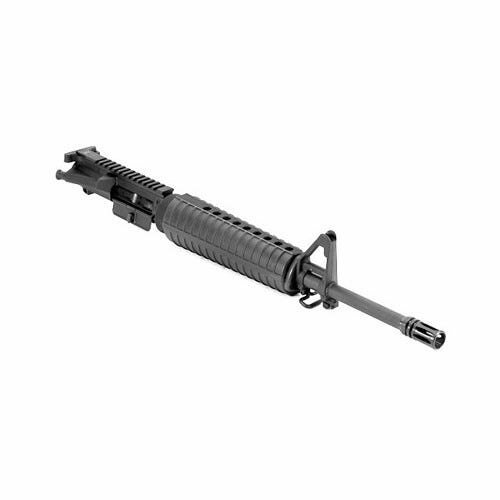 Complete Package - When you purchase an AR-15, there are no additional parts to worry about being compatible. Other firearms may require validating whether or not parts will work with it, but with an AR-15, you don’t have to worry about such details. Foregrips - More than likely you’ll want a foregrip upgrade to make you more comfortable. If you have military experience, you may also want to invest in a magazine well grip as well. Upgrade compatibility - A basic model AR-15 may be fine at first, but over time you’re going to want to buy upgrade and performance parts, but not all basic rifles allow it. There is something to be said about building your own firearm. You want to be completely satisfied with your AR-15, and what better way to do so than by making it yourself. Get What You Want - You’ll get exactly what you want in an AR-15 since you’re the one building it. From the perfect buttstock for your shoulder to the ideal rail, your firearm will be custom made for you, by you. Take Your Time - You don’t have to be in a hurry to build your ideal AR-15. You can buy the parts you want when you can afford them, accumulating them over weeks or months until you have everything you need. Experience - Working on your AR-15 will help you gain precious experience working on guns. While not all firearms are the same, you will acquire knowledge and know-how as you put your own together. This is especially true for matching your upper receiver with the lower and barrel. Lack of Interchangeable Parts - Some of the parts for the AR-15 are considered “mil-spec” which means they meet the required specs for the M16. Mil-spec parts may not fit right, while other parts may require additional research and maneuverability. Can Be Challenging - Building your own AR-15 can be a challenge, especially if you aren’t the type of person who is mechanically inclined. You may end up making mistakes that cost you more in the long run and result in an unsafe firearm. Ultimately, the choice to build or buy an AR-15 rifle is completely up to you. It’s a personal one, just like the decision to purchase any firearm. There are plenty of various options and customizations available on the market, but none may be the right rifle for you. If you’re not concerned with having the perfect rifle, buying an AR-15 might be the way to go for you. However, if you’re more interested in designing and building things, and want to gain some experience in assembling firearms, building your own AR-15 might be for you. It will give you the opportunity to make the perfect firearm for you with all the parts you want.